1. 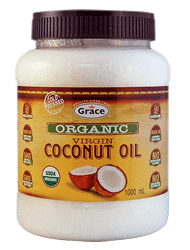 In a saucepan over medium-high heat, sauté the garlic, onion and Jalapeno pepper in 2 tablespoons of Grace Coconut Oil. 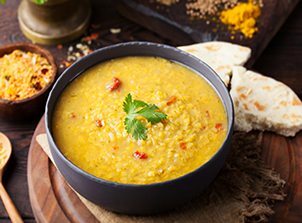 Add the turmeric, Grace Yellow Split Peas and 3 cups of water. Bring all of the ingredients to a boil, then lower the heat and simmer. 2. Leave covered until the peas are soft (about 30 minutes). 3. Add Grace Coconut Milk and simmer for 5 minutes, stirring occasionally. Add salt to taste. 4. 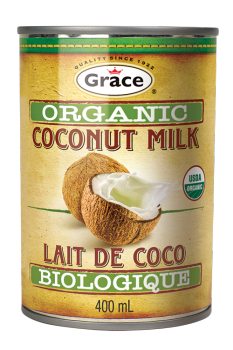 In a separate skillet add 1 tablespoon of Grace Coconut Oil and melt over high heat. Add the shallots, the red chili pepper flakes, bay leaves and mustard. Fry until the mustard seeds begin to turn gray. Stir into the Grace Split Peas and serve.